So far he seems like a likable kid with a ton of talent and is fun to watch. Not sure why he gets so much hate on here. because he is beyond terrific, not just pretty good. Hate isn't the right word. Mahomes is just today's flavour. In 2019 there will be a new favourite flavour. Probably Mitch Trubisky. Yawn. Lol he was the league MVP. I guess everyone should’ve just ignored him all year. Noone’s a Hall of Famer after one season. Shaun Alexander broke the NFL rushing touchdown record and was NFL MVP and those predictions that he was Canton-bound after that season look laughable now. He has played 1 year. He has a long way to go to canton. Nobody (QB-wise) had a better year than Brady last year. Unless you mean the 2018 calendar year (i.e. regular season). Because Brady was the only QB hoisting the Lombardi Trophy this past season. Even during the regular season he was top 3,4 considering weapons. Declining Gronk, Edelman 4 weeks suspended, Gordon in season acquisition and left before the Pitt game mentally, Michel missed TC, mid season part. Not even going to mention that they lost their best receiver from the previous season. Hogan declined considerably as well. They don't give out Lombardi trophies for stats. What kind of stats would Brady have had last season if he had had Hill, Hunt, Kelce, and Watkins? The league would have cancelled the season in October because the thirty-one other owners would all be jumping from their penthouses as Brady racked up a 7,000-yard season at the age of 41 and we went undefeated via weekly blowouts. 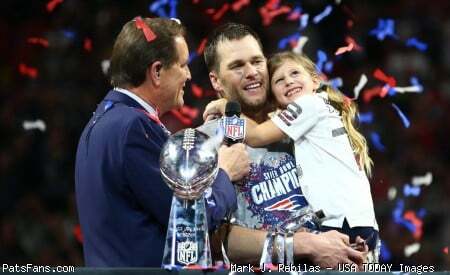 Brady>everyone else. I don't think he gets "hate" on here - I think those who would put him in Canton, claim the "torch is passed," or that he's the GOAT get deserved scorn. If Brady retired and I could pick any QB to handle my team it for the next 4 years, it would be Russell Wilson. If I could pick any QB to take the next decade and be the franchise, it'd be Mahomes. That could very well change, but I doubt it. Let's see year two with some adversity and a year of film on him. Who on here is saying any of that? Even if it’s just the media how is that Mahomes’s fault? He’s not out there saying “the torch is passed I’m the future”. No one talked about them their MVP years? A seemingly reasonable KC fan on here said it exactly - and got roasted.